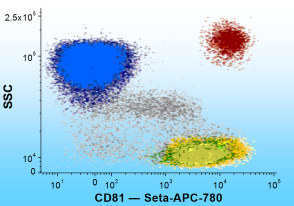 Flow Cytometry is a powerful technique to measure multiple parameters from cell populations. 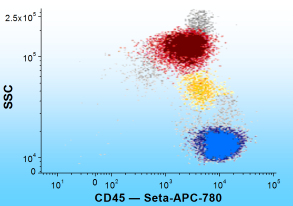 Flow cytometers differentiate cells based on their size, internal complexity, and fluorescence signature. 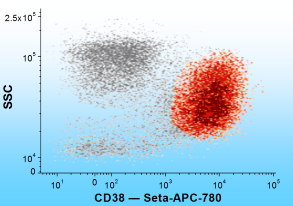 Qualitative and quantitative analyses of cell populations have relevance for clinical and research applications. 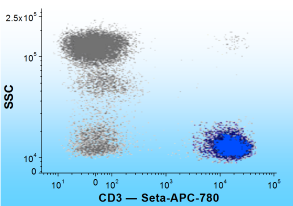 Seta-405 is identical with Pacific Blue with excitation and emission at 401/452 nm. Seta-APC-705 and Seta-R-PE-775 are our latest editions to this product line. For a specific listing and more detailed information about these tandems we refer you to tandem-conjugates. Please contact us if you are interested in a sample for testing.